Description: Diaphoretic herbs influence the entire circulatory system and increase perspiration for Colds, Flu, Fever, etc. Description: Formulated with herbs high in iodine and iron for Parasites, Candida, Fungus, Molds, etc. Ingredients: Peppermint, Black Walnut Leaves, Artemesia Annua, Bladderwrack (kelp), Pau d’ Arco Bk., Stevia and Irish Moss (kelp). 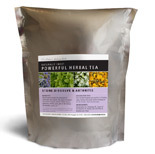 Description: This tea contains herbs high in minerals often not found in our foods. Herbs high in potassium chloride dissolve and is designed to help in cases of fibrin (the cause of catarrh), blood clots, fibroids, cancer and tumors, etc. Ingredients: Burdock Root, Dandelion Leaves & Root, Irish Moss & Bladderwrack, Kelp, Licorice Root, Alfalfa, Flax Seed, Elderberry Blossoms, Icelandic Moss and Stevia. Description: Formulated with herbs that support the immune system, cleansing the blood and lymph, assist nature with skin, blood, and a variety of diseases. Ingredients: Burdock Root, Black Walnut Leaf, Fenugreek Seed, Artemisia Annua, Yellowdock Root, Irish Moss (kelp), Peppermint, Bladderwrack (kelp), Licorice Root, Shavegrass and Stevia. Description: This tea helps with kidney stones which are composed of carbonates and calcium. The action of sodium ions tends to liquefy Calcium, Kidney Stones, Gallstones, Arthritis, Gout, pain in the kidneys and bladder, Cystitis, etc. Ingredients: Marshmallow Root, Hydrangea Root, Queen of the Meadow Root, Parsley Leaf, Irish Moss & Bladderwrack (Kelp), and Stevia.